Pasta Martelli just arrived in the warehouse. We received a new container from Italy and, for once, we had no problem with FDA and US Customs. Thank goodness! 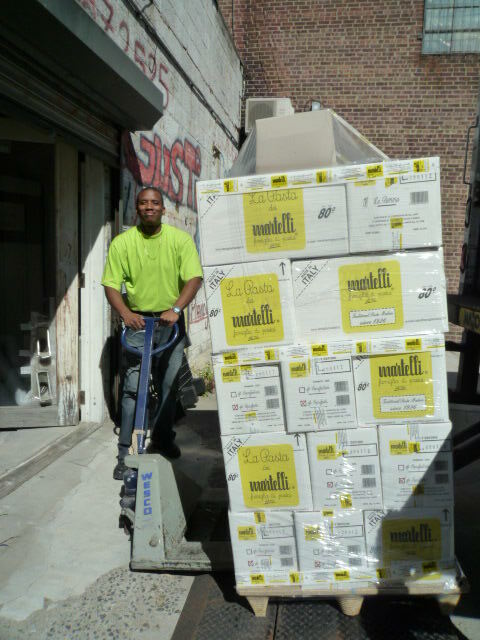 Here is Gerard, downloading the truck with the precious cargo. It’s an important moment because we have been out of pasta Martelli, in particular the spaghetti, for quite a while. We all know it takes a long time to make artisanal pasta because it needs to dry naturally for hours and hours. These spaghetti must have been drying for two months! With the Martellis, the order process takes a very long time. They have a small factory with small production but high demand. You just must be patient and wait -there is nothing else to do. If you were desperate and thought you could go to the source in Lari, near Pisa, to buy their pasta, you would have returned empty handed, because the Martelli don’t sell their pasta there, either. The only place to buy Martelli pasta on the internet is at Gustiamo. Previous Post This and That Lunch with Gustiamo – Don’t Call the Office Between 1 and 2pm, Pls. Next Post Why do merchants price their items $X.99? Do they think we are idiots? MMMM, good to know the Spaghetti are back. Although the Maccheroni are really my favourite. So I guess you can say you have still the best online offer in the USA, when it comes to Martelli Pasta. There is nobody else with a lower price in the USA for Martelli than Gustiamo! Believe me, I have checked that, actually for several days, and there is nobody else below your price. Grazie Marion. Haven’t heard from you in a while. Hope you are well and buy lots of Maccheroni from us. They also arrived. Ciao!!! Pasta is pasta, right? Not exactly. The Martelli family use the hardest durum wheat flour. Their pasta is extruded through traditional bronze dies which enables the sauce to adhere to the pasta, and finally, they take time to allow the pasta to dry slowly which gives perfect texture and flavour. Once you try Martelli’s pasta you will know how good dried pasta can be; macaroni and cheese in particular will never be the same again. cara Cameron, you are so right! artisanal pasta is a completely different product than industrial pasta. artisanal pasta makes a wonderful dish with just a few drops of good ev olive oil. grazie for liking pasta Martelli! ciao! we just returned from two weeks in italy where we were fortunate enough to tour the martelli pasta factory in lari. we brought a few bags home to the U.S. but would love to buy more. can we buy by the case and if so, is there a discount? is it worth it to hire a private driver so we can tour the factory?